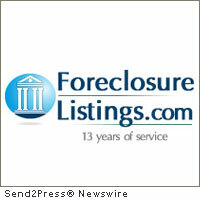 NEW YORK, N.Y., April 19 (SEND2PRESS NEWSWIRE) — ForeclosureListings.com reports foreclosure home statistics and the average price of a foreclosure home in states and cities that had higher home prices entering foreclosures in the first quarter of 2011. The most expensive house to be lost to foreclosure in the past three years in Jacksonville, Florida, for example, sold for $1.5 million Wednesday – $1.4 million below its county property appraised market value. The nine bedroom, 11 bathroom, 10,000-square-foot, bank-owned Queen’s Harbour mansion, built in 2005, has its market value at $2.95 million set by the property appraiser’s office. With the sixth-most-expensive ZIP Code in the country, Beverly Hills revealed a 700 percent increase in foreclosures of homes valued at $2 million and higher over the last three years. Home prices are down almost 32 percent from their 2006 peak nationwide, and many economists expect them to drop at least 5 percent more in 2011; some expect even steeper declines. Millions more homes still face foreclosure as the sputtering economy, uncertain- and under-employment, and government spending and attempts to relieve the situation struggle to overcome the inertia. With tight lending standards, and almost one-quarter of homeowners with mortgages underwater, it will be a long, difficult road for them to move into better homes because they owe so much more than their current house is worth. Of the over 70 million Americans who were born between 1945 and 1960, one-third (or approximately 212,000 people) have zero retirement savings. The only money they have is their equity in a house, so they must sell when they enter retirement age, which some have begun doing. This adds more houses to the market, further pressuring prices down. Nationally, 1 in 7 homeowners currently with a loan over $1 million is seriously delinquent on mortgage payments. For loans less than $1 million, the ratio is closer to 1 in 12. As many luxury home owners saw the value of their homes drop dramatically when the housing market crashed, they were suddenly making huge payments on a house that was worth substantially less than the mortgage. Many wealthier homeowners realized this as a poor investment of their cash and decided to stop making payments; a “strategic default” action. Considering that banks are very slow to seize high-end homes (expensive houses cost banks a lot of money to maintain and they are very difficult to sell during a slow housing market), and that abandoned homes lower neighborhood property values of surrounding houses, it is not in the best interest of banks to seize expensive homes facing foreclosure. Many luxury homes have been priced unrealistically and will never sell at the current asking prices. Difficulty in securing a Jumbo loan to finance custom homes or luxury houses is the main reason for inactivity in the $500,000-$1,000,000 plus homes. There is an enormous inventory of housing that is not yet on the market. Millions of homeowners in financial difficulty have simply stopped paying their mortgages, and the banks are allowing the owner live in the house for free. When a bank forecloses and takes possession of a house, the bank is responsible for property taxes and maintenance; an added cost to the bank. If a bank then sells the foreclosed house at current prices, the bank has to admit a loss on the loan. So there is a deluge of foreclosures approaching that the banks are ignoring, for the time being. The median home price in the Tampa Bay area, for example, is $111,100, a 54 percent decline from the peak of $239,000, of June 2006. Presently, one in six houses in Florida are empty, and according a national delinquency survey, in the last quarter of 2010 more than 24 per cent of Florida home loans were either delinquent or in foreclosure. For the investor or bargain hunter, ForeclosureListings.com reveals states that offer some possibilities of foreclosures in the market. California is the number one and this month registered 177,939 properties in foreclosure, representing an increase of 5.75 percent in comparison to just last month. California is followed by Florida with 140,505 foreclosed homes. In April Florida had 11.63 percent less properties available in March, reflective of the hidden tsunami of homes not yet registered with banks as explained above. In Michigan, there was a difference of 37.16 percent down; 22,049 foreclosures in April compared to 35,088 in March. Texas also delivered negative statistics: 21,148 foreclosures in April against 34,952 in March, down 39.49 percent. But in Georgia, the state now has 65,246 foreclosures recorded, up 7.36 percent; a sign of having passed the point where banks have been able to keep the more expensive homes off the foreclosure lists. ForeclosureListings.com charts top state foreclosures in relation to prices. Michigan changed a great deal from March to April. Currently, prices of expensive homes in foreclosure are over $862,630, an increase of 60.67 percent, similar to Georgia, which reflected a huge increase of 297.82 percent. In March the average price for a Georgia foreclosure was $163,566, but now is $650,693. Texas also showed an increase in the price value of properties in foreclosure. In March, the prices were up to $194,649, now prices are at numbers like $258,076; a 32.59 percent rise. Notice that in California the scenario changed to a positive side, showing a reduction of 4.71 percent in home values, with a price average of $202,658 today compared to $212,682 last month. Florida, however, continues to struggle with the expensive value of foreclosed homes. In March the average price was $131,367 and now is $138,008 – a change of 5.06 percent. See http://www.foreclosurelistings.com/foreclosure-rates/ for more up to date foreclosure information. 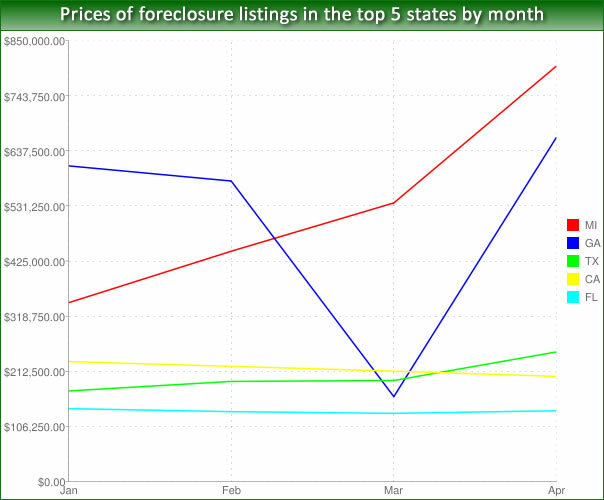 Image 1 Caption: Price of Foreclosure Listings in the Top 5 States by Month. 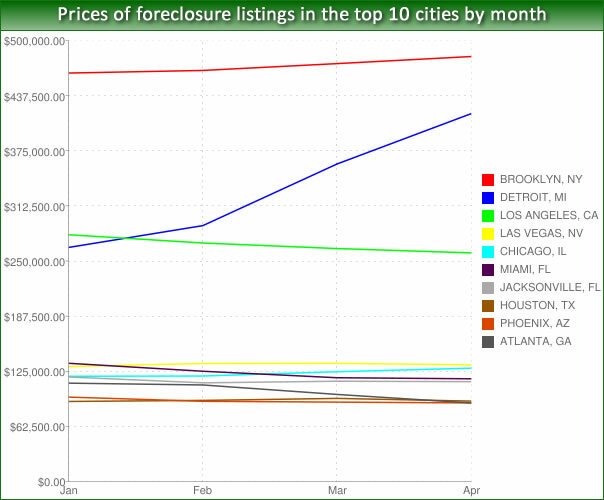 Image 2 Caption: Price of Foreclosure Listings in the Top 10 Cities by Month. Original Keywords: Foreclosure Listings, most expensive zip codes for foreclosed homes, report, study, real estate, lists, database, Beverly Hills, Kevin Simpson, New York business news, online, web, internet, on-line, portal, directory, find, locate, invest, homes ForeclosureListings.com New York New York NEW YORK, N.Y.
REFERENCES: Business News, Foreclosure Listings, most expensive zip codes for foreclosed homes, report, study, real estate, lists, database, Beverly Hills, Kevin Simpson, New York business news, online, web, internet, on-line, portal, directory, find, locate, invest, homes ForeclosureListings.com New York New York NEW YORK, N.Y.